Potty training is a topic that I get emails and Facebook messages about daily. A lot of people have opinions on the topic and there are loads of resources out there to help parents. Today I've put together 9+ of my favorite toddler potty training resources that I've found helpful. If you have additional resources that have been helpful to you, please share them! night potty training... when to do it? potty training and a joint custody situation... how to manage that? Do you have any potty training questions or issues? 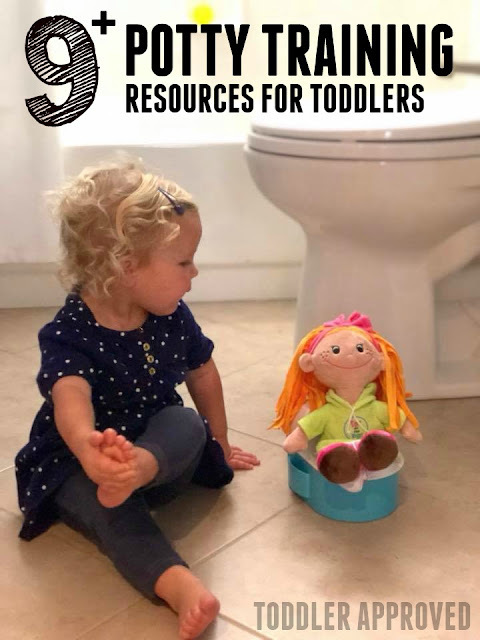 I created my Potty training Resources for Toddlers pinterest board so that readers could have easy access to all of the suggestions and ideas that I find. Since every child is different, I think having a variety of resources is really helpful! I always like to avoid big mistakes... so love articles like this one from Zephyr Hill blog. Have you heard of this? 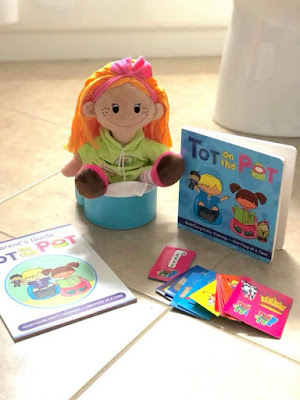 Tot on the Pot is an all-inclusive play-based potty training system that is super positive! It comes with a Parent's Guide to Potty Training, Children's Book for your child about potty training, a Tot doll (to be their potty training partner), a Pot (Toy Toilet), and Activity Reward Cards. Each Activity has ZERO burden of preparation for parents and only uses materials readily available in every home (e.g. toilet paper, socks, etc). 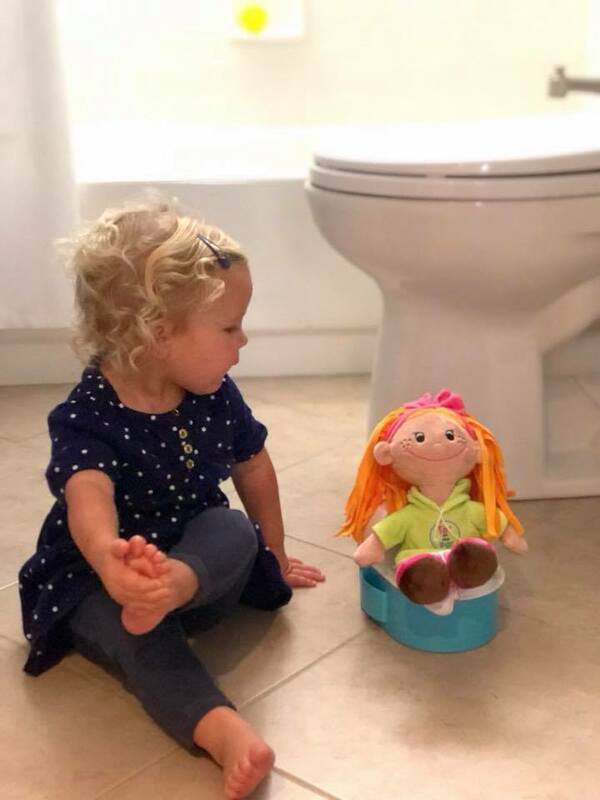 My toddler is loving her little tot on the pot doll! Disclaimer: Tot on the Pot graciously sent me this doll for free so I could check it out. This is how we did potty training at our house. Some people moan and groan and say the way that we did it was way too much work. It worked perfectly for us but each family will be different. My kids were potty trained pretty quickly despite being slower than the 3-day-method so I think it was a success! 4. What to do when potty training goes wrong? 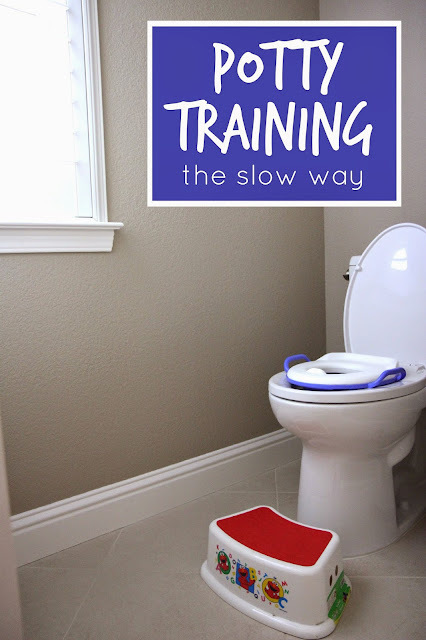 I read so many articles with kids learn to potty train easily and perfectly. Sometimes it is nice to find some we can relate to when it all goes downhill. 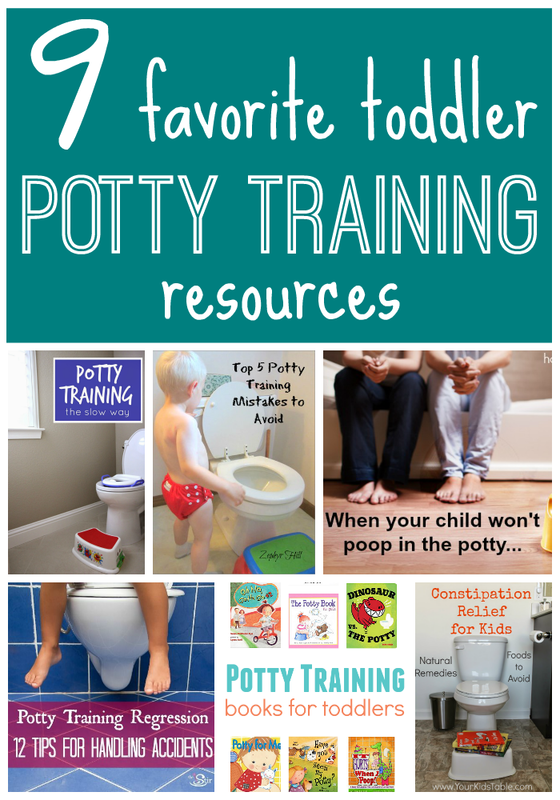 Potty training is not for the faint of heart! This post from Mums Make Lists has some useful ideas. Janet Lansbury is not a fan of adult-led potty training and explains why in this article. I think she makes some great points! 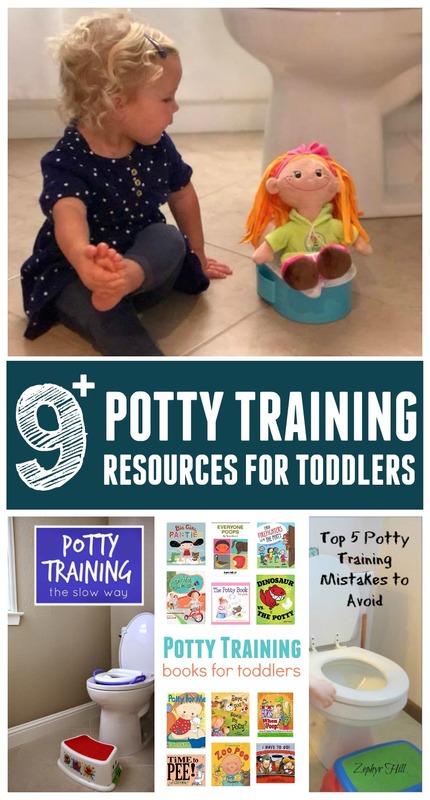 This list put together by No Time for Flashcards includes 12 awesome books about potty training. My almost 3 year old is ready to potty train so we need to grab a few of these to start reading! How you handle your child's accidents can really determine how he/she feels about potty training and how successful the experience ends up being. 8. What helps constipation in kids? As kids beging potty training some struggle with constripation. Here are some natural ideas that can be helpful shared by Your Kids Table. This list put together by Honey Bear Lane comprises a good range of ideas so if you are struggling you might find something useful. 10. When your child won't poop in the potty. This post from Happy Hooligans shares 10 suggestions for how to get your child comfortable and pooping on the toilet. 11. Is your child ready for potty training? Here are 10 Signs. 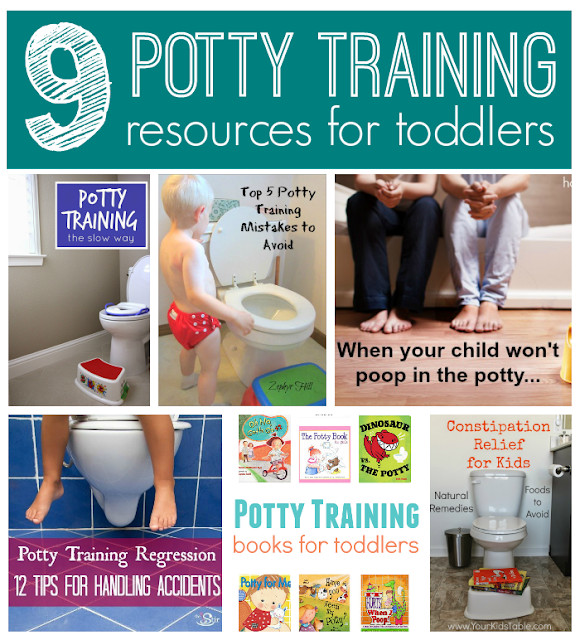 These ten readiness signs can be helpful when you are trying to teach your child how to use the potty. Learning how to use the potty starts long before your child ever sits on toilet. Does your child have any potty training issues? Do you have any suggestions/articles for the challenges talked about at the beginning of the article? Pass them along! My 3 year old son will hold his pee for upwards of 20 hours until I put a diaper on him. He will sit and potty and "try" but isn't letting it out!! I have been trying for 6 months and don't know what else to do. I've tried naked outside, naked inside, water play, treat rewards, sticker rewards, books, aiming items in potty, sitting down, standing up, watching friends, watching daddy. I know once he "gets it" he'll be golden, but can't get him to make that step. He doesn't have accidents when wearing underwear overnight or naps. I'm at a complete loss!! Any advice? Let daddy show him.... especially where it can be started outdoors and learned side by side then move indoors where aiming is the challenge. I know you said you've tried waterplay but have you tried running the faucet while he's on the potty? That and placing his feet and hands in water while he's sitting on the potty might help. Thank you for the resources! My son was a somewhat late at learning to use the toilet and needed to learn how before he could start Montessori preschool. We found the Montessori method outlined by Sarah Moudry in her booklet Toilet Awareness to be really helpful. The reward has to fit the child's interest in order to work. My son couldn't have cared less about stickers or M&M's, but he loves letters, so I made a sign of outlined letters to hang in the bathroom (ex. SWIMMIMG, DINOLAND, GAME, etc...), and each time he went potty he got to color in a letter. When they were all colored in he got whatever the sign said. It worked like a charm and he was completely trained (potty/poops/dry thru the night) in a couple of weeks. My daughter just wants to sit on the potty all day and not put her clothes on and when I do finally get clothes on her she takes them back off saying I need to pee in the potty I glad that she is trying so hard but its really hard to do anything what can I do?? Thanks for sharing great tips.. Our little guy is in the process of leaving diapers for good. As soon as he turned two we tried potty training but it seemed like he wasn’t ready to give up his diapers. My son (3 today!) is perfectly happy to use the potty or toilet for both ones and twos ... but only when we tell him to. We just cannot get him to tell us when he needs to go. Consequently we have to remember to sit him on the potty every hour or so, or he has an accident. We have been at this stage with little improvement for three months now. Help! We started our 2-year-old son with a cute creative potty seat which seems like a vehicle. Firstly we kept in the living room, since he spent the most time there. Then we gradually moved it closer to the bathroom. Great Potty training. thanks for sharing. For best potty training for kids, you should have best small toilets for bathroom. My three year old son will be four in February. He knows how to use the potty, he has done it before but refuses to give up his diapers. He doesn't want to wear the big boy underwear even with his favorite characters on them. He wants to stay in his diapers and always tells me no when I ask if he has to go potty. How do I get him excited to use the potty and ditch the diapers???? Get rid of your diapers. He won't have a choice.